Interview with Dr. Herschel Rubin 7 August, 2012 at his home. Dr. Herschel Rubin, 7 August, 2012. In the beginning Dr. Rubin mostly talked about his own neighborhood. That would be pretty much from the corner of Monroe St and West 4th to Jefferson and West 4th street. We provided this map so that readers can follow along. Also, the house Dr. Rubin lives in is not shown on the map since it had not been built yet. However, the space is shown where it would be built in a couple years . 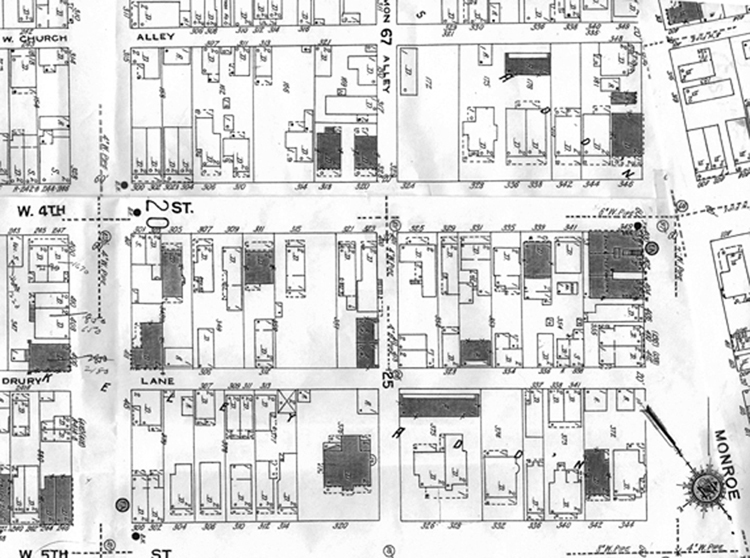 This is from the 1923 Sanborn Fire Insurance Map. Dr. Rubin: I was born in half of a double house. This side is 336 west fourth street. There was one family on each side. When I was 10 my folks built this house. That would've been in 1926. Dr. Rubin's house, 336 West 4th Street. And that house was remodeled into four apartments. When my wife and I were married, we moved into the upstairs apartment on the same side on which I was born so that what became our living room had been the bedroom in which I was born so I've only lived in two houses my whole life. Laughter. Not counting, I mean you know, in college and in the service I lived in various places but as a as a residence, well and then we just lived here and the house I was born in down the street. 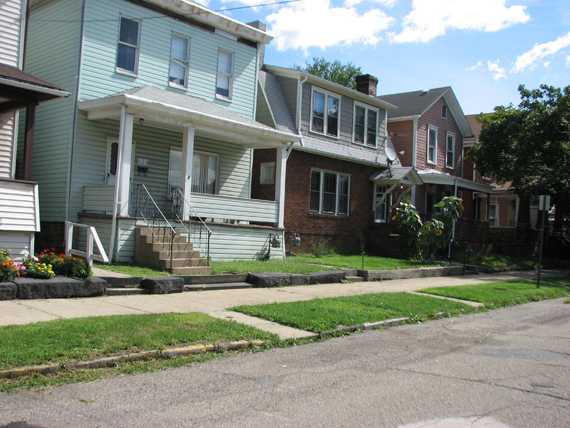 We moved in here when my folks moved to Cleveland, and that was when I was in the service and it was '43 or '44. My daughter moved over here then from that apartment over here. So, as I said, I've only lived in two houses in my whole life. 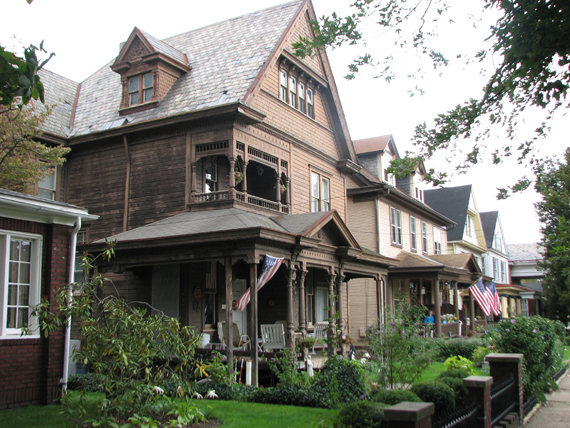 The yellow house with the American Flag to the right of the big brown house is the house Dr. Rubin is referring to. The address on the map would be 338 West 4th. Web: You knew our famous actress? Dr. Rubin: Who was that? Dr Rubin: Oh yes! She was the girl that everybody was drooling over when we. Hey, I better be careful what I say . We were probably in the same class or within a class, Oh yes. Was she related to you? Web: No but we interviewed her about a year or so ago. Dr. Rubin: Oh, is she still living? Is she my age? Older? Younger? Web: She was 94 or 95 when wintervieweded her last year I think. Dr. Rubin: Within a year or two. I was 96 in January. Ninety-six and three quarters I tell people now. I watch those fractions. We went back and looked at the interview with Elaine. She graduated in 1934, Dr. Rubin graduated in 1933. The neighborhood has changed, across the street, I know you can't see it, but the Monroe Apartments, they were there. 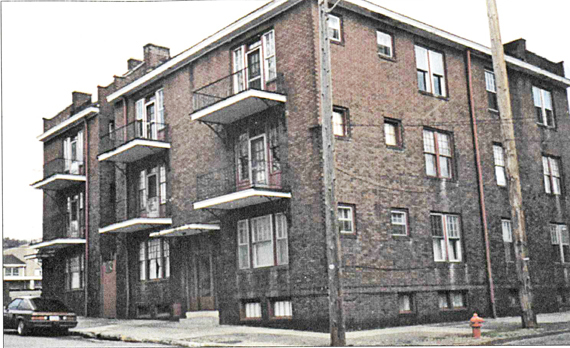 Monroe Apartments as they looked in the 1990's before the fire. They have since been torn down. 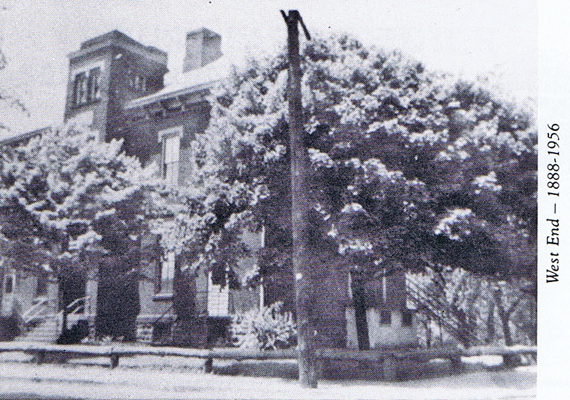 The house on the corner with the big pillars belongs to Caywood. The Caywoods live down there in the house on the corner of Fourth and Monroe. 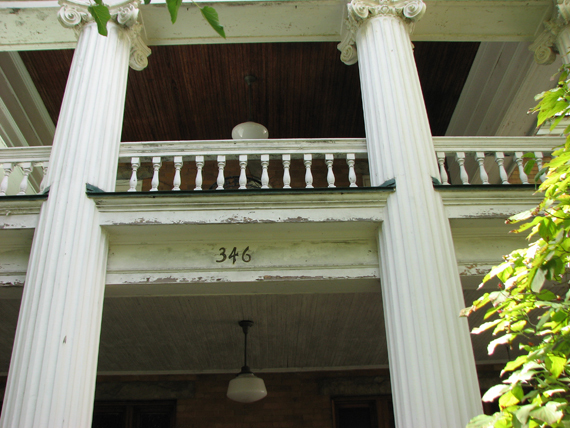 The corner house with the big pillars. Dr. Rubin: Now Carol Minto lives in that house. She's got some sort of a government job, I can't tell you what it is. But I know she lives down there by herself. Up, all the way up the street , there is nobody up there now, Some of the houses aren't there anymore. Web: Back in the 50s and probably later the Metz lived two doors up from here. 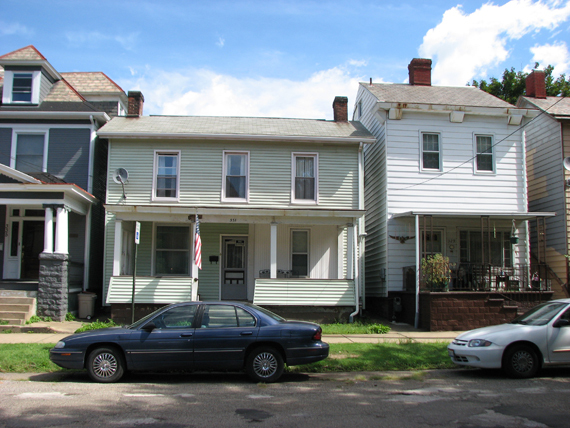 The middle house is the house the Metz family lived in, 318 W 4th Street. 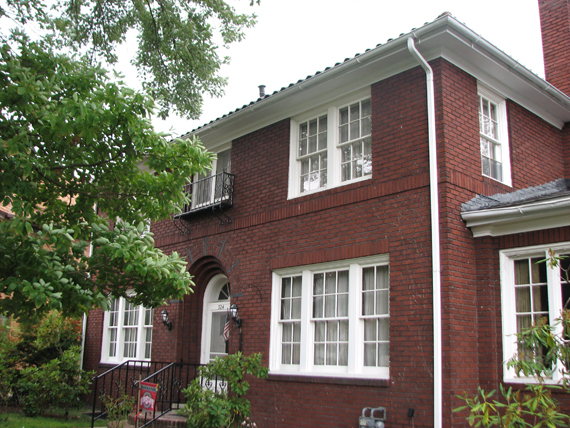 Web: Jack and Dolores Brown lived across the street about four doors up. Dr. Rubin: oh yes, across the street, they were the third or fourth house up. 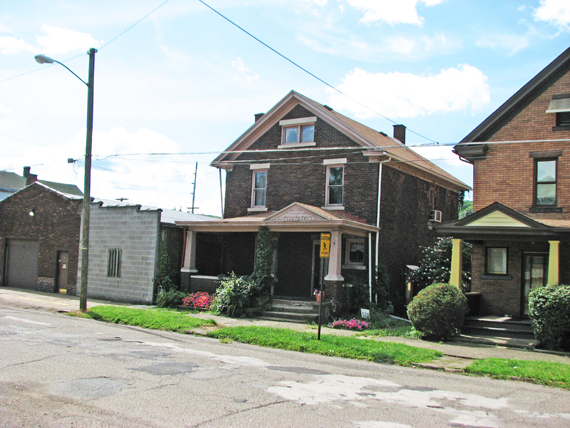 The dark brown house, fourth up is where the Brown family lived , 315 W. 4th Street. Dr. Rubin: Mary Ruth Bebout lived in the second house from the corner. She was a schoolteacher did you know her? Web: No, I knew Mrs. Poynter who lived in the Monroe Apartments. 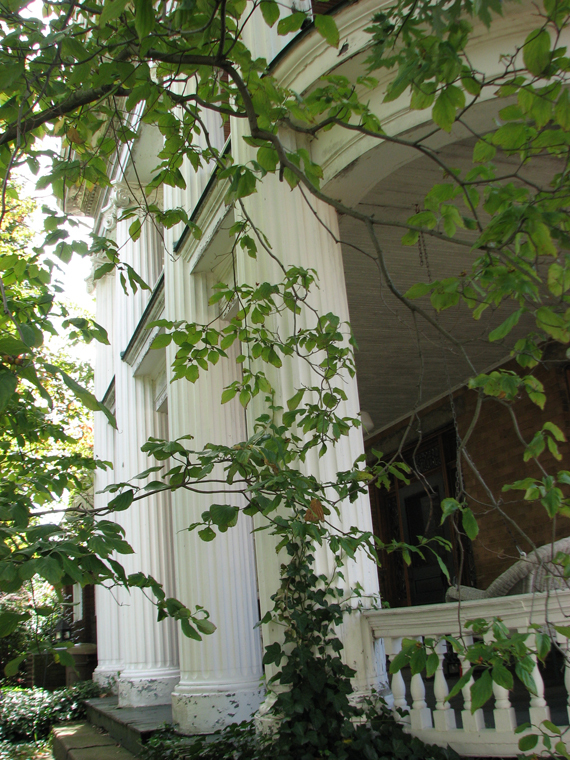 Additional research on our part indicated that John Bebout lived at 321 W 4th and a Mrs. Lena Bebout lived at 321 1/2 W 4th Street. Dr. Rubin: oh yes Francis Poynter, yes. Web: The Weber family lived over there. Dr. Rubin: right, yes Webers, right, I had forgotten about them. Eckerts lived right next to those apartments. Grandon Eckeret lived at 341 W 4th Street. Web: and then of course Scafides up on the corner. This was Scafide's Grocery Store in years past. Dr. Rubin: oh, there has been a market up there ever since I was young. Sometime before Scafide's, years ago, there was a Ruben's Grocery Store. Web: on this side yes. Dr. Rubin: on this side yes. A Ruben's market and they lived down the corner on the alley. Web The house they lived in is still there. 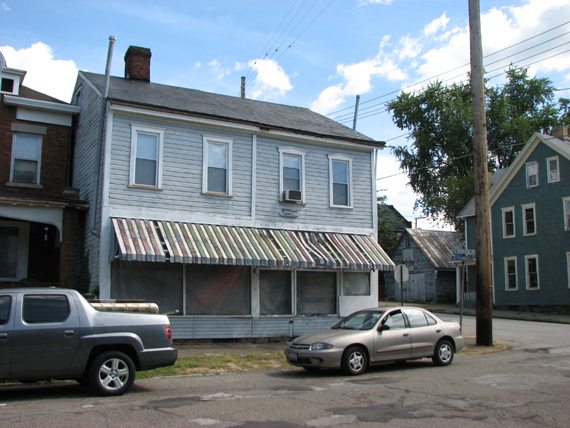 This is 315 Jefferson Street the former home of the Abram P. and Fannie Ruben who owned Ruben's Market. Dr. Rubin: yes you're right, yes, then I don't know when it became, on this side, Rayl's Market. I don't know anything about that now. Used to go up there a lot but as I got older I don't go up there anymore. Based on EL City Directories it appears that Ruben's grocery turned into Miller's Grocery and then turned into Rayl's Market later in the 60's or in the 70's. But I can remember when you used to be able to go down the street. Is this the sort of thing you want me to talk about. Web: Sure, anything you want to talk about. Dr. Rubin: A streetcar came across the bridge. The Newell Bridge, the Newell streetcar, came across the bridge turned to the right on fifth Street. It came up to the corner over there by the Temple (Monroe Street and W 5th) turned down and up the street here (W 4th Street) and went as far as the YMCA, is what I remember. Now that was the Newell streetcar. That, I think, was strictly for the pottery workers, as was the bridge. Sixth Street now had streetcars. Well you could actually go far as I know myself, you could ride from Steubenville to Beaver. It was the interurban car we called it. You could take it down to Steubenville and catch, it was right outside the train station. You can catch the train there and take it to Columbus. Going up the other way it went up to the train station in Beaver. From there you could take the train to Pittsburgh from the P&LE. Now that line went up sixth Street then up the hill to the Hill road up through East End, okay. It also went down, down sixth Street in back of the hospital where that road goes down now and turned into the loading dock area of the hospital. There was a trestle down there clear down to Patterson field area. The trestle Dr. Rubin was talking about. 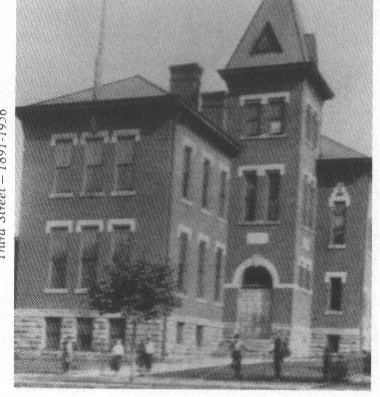 At the top on the North side of the street was Sixth Street School and on the south side of the street the City Hospital. Then up to eight Street and down alongside the road to Wellsville. Not where the road is the right with it. It would have been on the River side. There was a car that went from Wellsville to the state line. Then the interurban was a different car the went all the way through. 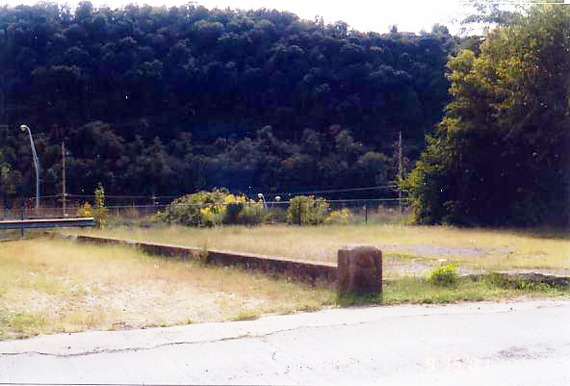 The railroad down here, used to be able to take a train to Pittsburgh. Catching a train at the station on 2nd Street. As a matter-of-fact, there was nobody who did orthodontics when I was a kid and we used to go to Pittsburgh on Saturdays. You had your choice of two trains. I think it was like eight or 11 or something like that and it would take you to the Pennsylvania Station in Pittsburgh. You had to train coming back sometime in the afternoon. The station is what Hans Hacker painted on the plate. That is the railroad station here on second Street. Right down the road from Mason Color and chemical. Now Hans painted the station, he painted a picture of the Mason Color and Chemical and another in that area. My wife painted all three of them and if you didn't know it you wouldn't recognize it. Hans was very precise. Elsa was just impressionistic. I'll show you the difference between the plate and her painting of Pennsylvania Station down second Street. If I didn't tell you what it was you wouldn't know. That is just the way she did it. She didn't always paint that way but that is the way she painted that. Web: There used to be a lot of professionals here in town. Dr. Rubin in the Little Building I am the only one on the fifth floor. Joe King, the attorney, is the only one on the third floor. That is all there is above ground and there is the attorney Drumm and the TV Facts on the ground level. When I was a kid that building was loaded with doctors, dentists, lawyers, insurance companies. New York Life was there, Feldman's, the Kinsey's, Cooper. I have the office on the fifth floor where Dr. Birnbaum was there. Now Swearingin was on the corner, now that is not ancient history. Swearingin was on the corner of the fifth floor where the McKinsey's were. That was the professional building, that and the Potters Savings and Loan over there where Bob Beatty is in that building. Web: In the Little Building, they had a barber shop in the basement. Dr Rubin: Yes Right Right. FOR whatever reason the cassette player stopped recording for a brief period of time. I don't think there was more than a sentence or two missed. Dr. Rubin: George Banks was there forever I think, the colored man that was there was George's . . . . grandson or something. There was a shoe shine shop in there too, I think it was right to the right of the main entrance but who gets their shoes shined these days? (Laughter) And the store on the corner, the newsstand which was originally Bloomberg's. Dr. Rubin: Rearks , yes, I was trying to think of the name. Web: The Odd Fellows Building had a lot of professionals too. Dr. Gottleib was in there. Dr Rubin: Yes, right, I am glad you mentioned that. I used to go to him and I couldn't remember where he was. Web: It was the Odd Fellows Building. Dr. Rubin: Yes, right, I can see you're right. Some of these things if somebody mentions it will come back to me. Yes, I was trying to think where he was. We were personal friends and I couldn't think of what building he was in. We used to go to Sunday School . . . Is there a big meeting room in the Oddfellows? Web: Yes, there was at the top. The large meeting room that was once in the Odd Fellows Temple. We used to go to Sunday School before the Temple was built. The Temple was built in 1921, I think it was dedicated in 1922. Someplace I have a picture of the ground breaking of the Temple. 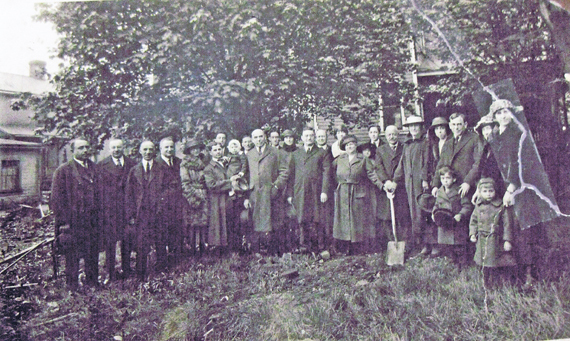 Ground breaking for the Temple B'nai Israel, W. 5th Street and Monroe St. 1921. The woman on Far right Mrs. Blumberg. Child in front of her, Leonard Blumberg. Woman's face behind, identity unknown. Third person Leon Rubin, Boy in front of him, his son the future Dr. Herschel Rubin. Next Zella Moyer, Mrs, Stein, Milton Wasby, Ruth Wasby, unknown, Belle Rickersberg, Mrs Wasby, Adolf Joseph, Gust?ve Bendheim, Mrs, Bendheim (Flora), Gordon Bendheim, Jacob Stein. unknown. Far left, unknown Sol Bloomberg, Gus Riehersberg, M. Newman, Ralph Stein, Herbie Jay, unknown Jay, H. Jay, unknown person. Photo Courtesy Dr. Herschel Rubin, names courtesy of either Leon Rubin or Dr. Herschel Rubin. The whole congregation was there. My mother was not there for some reason. There were three of us. I was the oldest little one, I was 5. 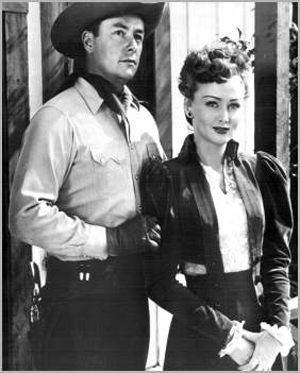 Leonard Bloomberg was in arms and Herbie Jay was in arms. I'm the only one left of that whole group. Leonard Bloomberg died of polio a few years ago. Herbie Jay was a Navy aviator. He was in combat, but somehow or other his plane went down over West Virginia someplace and they didn't find it for a year. Web: Is that the one who is in the Temple on W 5th and Monroe? 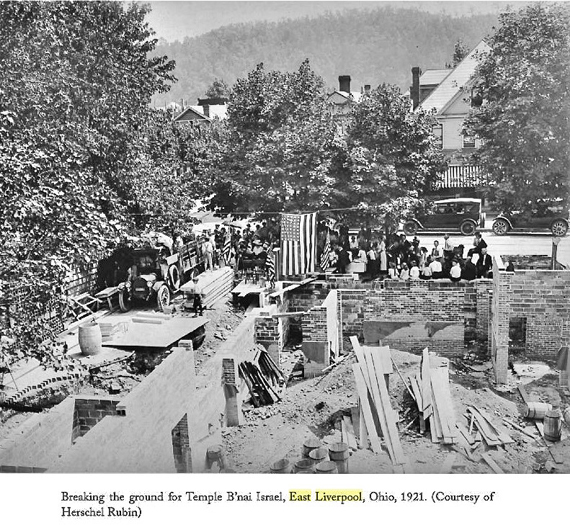 Construction of Temple B'nai Israel. Courtesy of Bobby Moore: "I ran across this photo on a Google search of ELO. From the book 'Jewish Communities of the Ohio River.'" Dr Rubin: Yes that's the one with the plaque. Jays has a laundry someplace near where Bricker's is. I know the picture's around someplace, but I wouldn't begin to know where. I would look at it and think, I'm the only one living out of this group. I don't why my mother wasn't there, except maybe my sister would have been just an infant so maybe . . .It was just a group standing there with somebody with a shovel. But I remember we used to have Sunday School either Sunday School or Services, and I think it was Sunday School. It would have been the top floor of the Oddfellows. I remember a lot of pews and we sort of divided them up for classes. There was another Jewish, That was the Conservative congregation, there was an older congregation down on Third Street, sort of catty cornered from the back end of where the Ceramic Theatre was, on that alley. Dr. Rubin: Leland Thompson bought that . . . I could be wrong on that, but I'm quite sure he bought the building. The congregations got smaller and smaller so that they merged in 1963. That was when they called it the B'nai Jacob, Sons of Jacob; ours was B'nai Israel, Sons of Israel. So now we call it Beth Shalom, House of Peace. That was in 1963. Dr. Rubin: Rubin: I went to a birthday party last Friday. It was a picnic out at Thompson Park, at Pavilion 5. I couldn't have found it, if they hadn't picked me up, I would have been wandering around. I used to go out there. They showed me the great big rocks that I vaguely remember that we used to climb up and down. It was down near the swimming pool. And I couldn't have found it if they hadn't picked me up. Dr. Rubin: Everything has just gone down so much in the last few years. You know all the empty store rooms up town. Dr. Rubin: I went to school at Third Street School. Up this way just across the Alley. There's a bunch of trees there now. 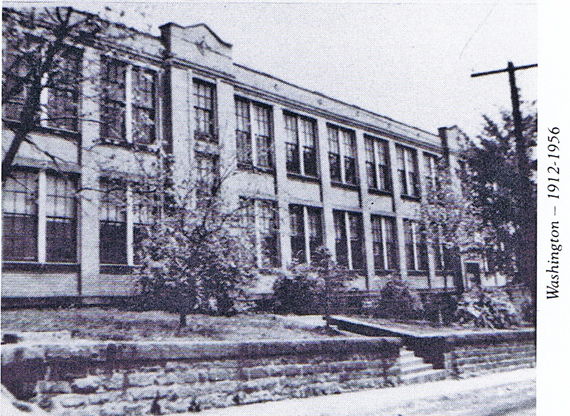 That was Third Street School-it had four Grades. 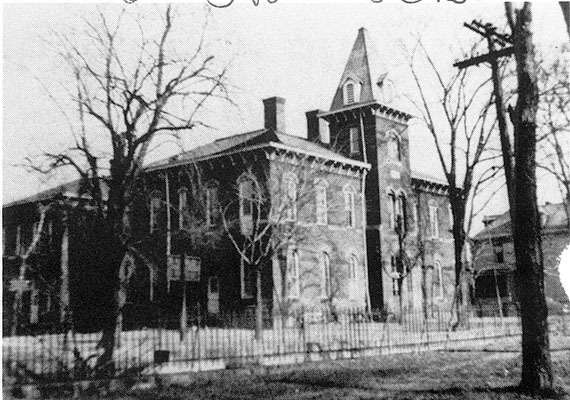 Then Sixth Street School was back of the Hospital and that had eight grades. So the second four grades I went up there and then went to High School after that. We walked, we didn't have school buses. There was a West End School. Would you remember that? Dr Rubin, Down just below, well it was on the corner of Eighth Street and Jethro Hollow. Web: Where the Vista Motel is now. Dr Rubin: Right.. Washington School is still there. Dr. Rubin: Yes. I was talking the other day. I got to wondering how did the high school students get home? We walked home for lunch, but how did the East End students get home. What these older people told me, they ride the street car or the city buses. They couldn't get home in time for lunch and have to be back. I thought surely they didn't walk and I don't think they carried, the were no school lunches, you know. I thought maybe they brought their lunches. 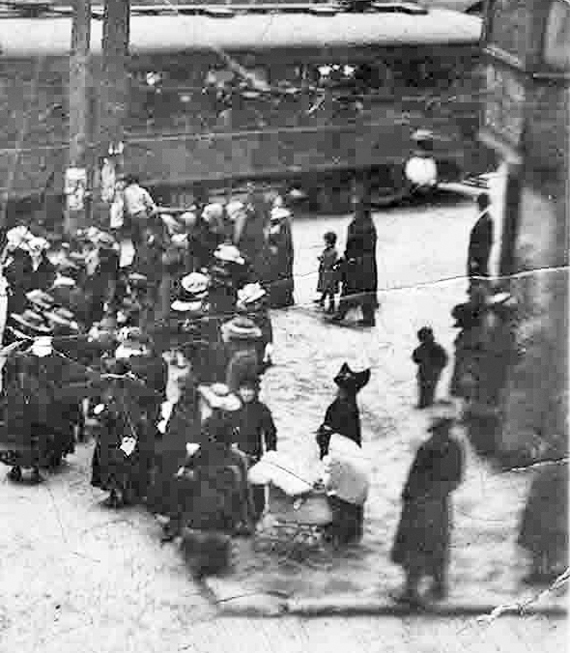 No, they had plenty of time to go home on a streetcar. Web: or they ate uptown. Dr. Rubin: I'm not sure if that time, a lot of that time was the depression period.